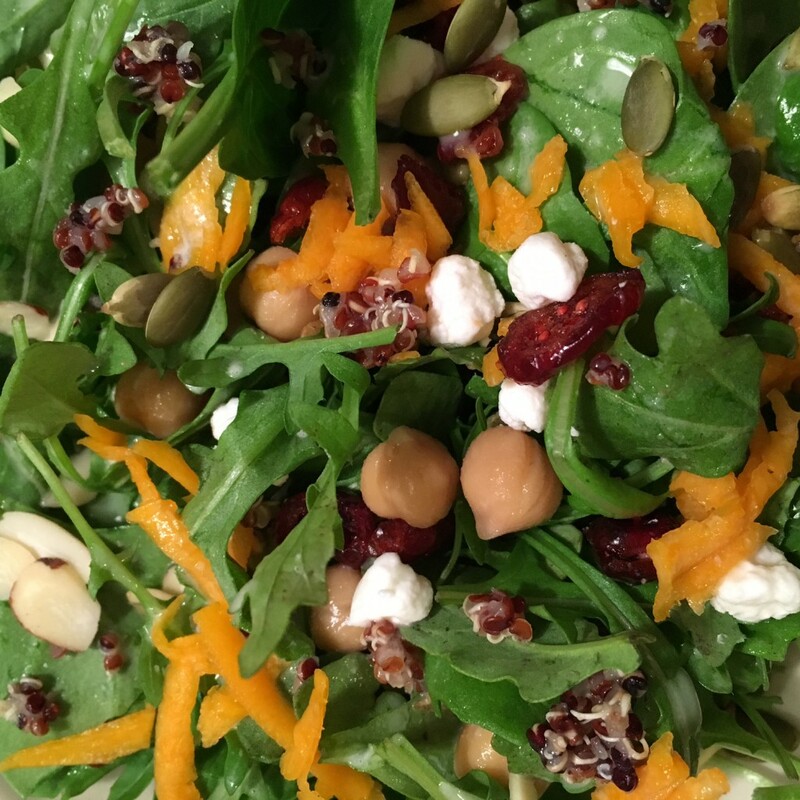 Packed with nutrients and protein, this spring salad is made with spinach and arugula, red quinoa, chickpeas, cranberries, shredded butternut squash, pumpkin seeds, sliced almonds and a bit of crumbled goat cheese. 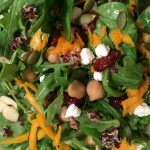 The dressing is a tangy homemade vinaigrette of white balsamic, tahini, olive oil, honey and kosher salt. Colorful and delightful! Rinse and cook quinoa according to package or bulk food bin directions, i.e. Rinse well, then cook in pot on stovetop: 1 c quinoa to 1 1/3 cup water for about 20 minutes. Cover 5 minutes. Fluff with fork. Allow to cool. Blend in blender white balsamic, tahini, olive oil, honey, and salt. Toss all ingredients together. Drizzle with dressing to taste. It is tough to find no sugar added cranberries but it can be done…my local Whole Foods carries some. Where can you find cranberries(organic?) sweetened w apple juice? Are there much, if any, benefits from farm raised salmon/ or smoked salmon? Are they harmful in any way?